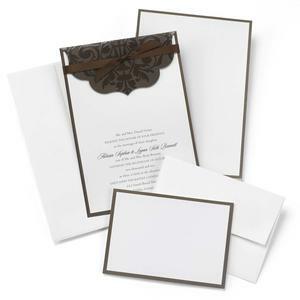 10725 - Brown base card with flourish design in clear varnish wraps over white invitation. Brown, 3/8" satin ribbon secures base card to invitation. 5 1/2" x 7 3/4". Coordinating R.S.V.P. cards, 5 1/2" x 3 7/8". Printed 2-up and perforated. White R.S.V.P. envelopes and invitation envelopes included. Package of 25.